The Warrior Queen is an important figure in the iconography and metaphysical actuality of Kali Yuga. As we have seen on our pages on Durga the return of the recognition of the full, supreme and sole Deity of Our Mother God took place within the Hindu tradition alone of all the "world religions" – and it is no coincidence that the Indian tradition is the only "world religion" with no founder, which shades seamlessly back into the Primordial Religion of our One Mother God. For this reason it was easier for the Indian Tradition to "forget", at least in certain times and places, its patriarchal redactions and return to the Original Faith. When this return of a truly Déanic thealogy (albeit in a strongly patriarchal social context) took place in the mediaeval period, with the great Devi Mahatmya, Our Mother God was represented in Her vikhelic Form as the warrior queen Durga. This was necessary because Kali Yuga is dominated by the influence of Sai Vikhë (whose masculine redaction in the West is Mars). It is this Iron influence that gives rise to patriarchy itself in the last and shortest Age, and of the strife, warfare and contention that characterises Kali Yuga. When the Cosmic Harmony, or thamë is disrupted in any of Her created worlds, Our Mother God may descend to set affairs aright. Where conditions are favourable, She may even ameliorate the rigours of patriarchal theology. In Kali Yuga it is metaphysically necessary that she should do so in Her form as the Warrior Queen. The same metaphysical logic applies to Herthelan mythology. Sai Herthe is an all-feminine world which some consider to be imaginary and some old to be one of the manifestations of all-possibility at a slightly higher level than our earth. Naturally, patriarchy did not take place in Sai Herthe, for there are no men and no masculine principle at this level of being. But the laws of cyclical history still apply and its own Age of Iron still evinces the diminution of spiritual and intellectual power, the material consolidation and some of the vikhelic influence that we find in the earthly Kali Yuga. And just as the return of a Déanic thealogy on earth is associated with the battle of the Divine Warrior Queen against the demons; so the current Era in Sai Herthe began with a great demonic assault and the descent of the Warrior Empress, Sai Rayanna. Sai Rayanna is not, strictly speaking, an incarnation of Sai Vikhë, (the feminine Mars-principle) but of Sai Raya, the Supernal Sun. This is equivalent to the ways in which Hindu thealogy makes it clear that Durga is not merely the Martial Angel, but the Supreme Deity Herself. 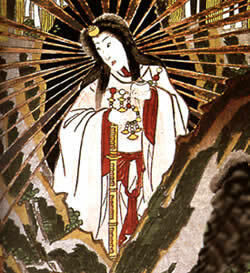 It is also a striking parallel with the Japanese doctrine in which the Emperor is the descendant of the Sun Goddess Amaterasu. All Herthelan Empresses are descended from Sai Rayanna, the incarnate Sun. The story of Sai Rayanna, the first Raihiranya (Empress), and her battle against the demons expresses the fundamental Mythic Truth of the Warrior Queen and Her battle against the Forces of Darkness in a context that is purely feminine both thealogically and socially. 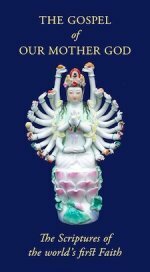 It may be seen as a form of the story of Durga without the patriarchal accretions, and as the defining mythos for all those who wish to inhabit a purely feminine spiritual universe. Chelouranya celebrates the Day of Sai Rayanna in late spring, on May 16th. The following MP3 audio clip explains the full significance of our Imperial Day, drawing parallels with American, European, Indian and Japanese traditions to illustrate the many-faceted and complex set of ideas that underlie the celebration of this joyful festival.